I can be so judgmental sometimes…. Like Nancy says in her challenge for us this week, I’m also not much of a girly girl. And unlike Nancy, for whom pink “is never my first choice of color for anything”, in days passed, I actively disliked and avoided PINK. But I am cursed (yes, and blessed) with the drive to find a lesson in anything I “actively dislike”. I wrote about PINK once before. I pick just a blossom leaf or two to take home. I put them in my pocket. That same week I am doing a closet downsizing for a Goodwill run and find the never worn, long-forgotten ugly pink vest tucked way in the back…..and then I remember those bright colored petals! Can you see the petal?? I blushed about the same color! Needless to say, it has become one of my favorite things to wear. I even got socks, a scarf and shoes with a stripe in the same color! Now I’m wondering if I owe my gift-giver an apology……. So I had to get to the bottom of this. Why such a strong reaction? It’s just a color, right? Way too long a story (including a couple of years of hard-core therapy) later, I traced my prejudice back to a relatively off-handed comment from my Aunt. I had run away from home at 15 and ended up living with her in high school. She sewed these beautiful clothes for me, whole outfits for daily and church wear, as well as various Prom-type formal dresses. Always in hues of pink. I was shocked and protested, apparently way too much, because it was a disagreement we were still having when she was on her death bed. She never believed me and I never forgave her for that. Still painfully ironic today because no budding young Flower Child, Hippie-Chick, California Girl in the 1960’s ever successfully fought harder to “save herself for marriage” than I did. Talk about swimming against the tide of the sexual norms of those days! So when I finally became more “enlightened” by the late 60’s and early 70’s, apparently I buried the reason for, but still held on to the active dislike of all things PINK! Aren’t you glad you asked?? I have since fully embraced PINK in all its hues and tones, in nature, as well as in my decorating choices. Here’s an example, if you feel inspired to read more about it. I wrote it to anchor the gratitude I have come to feel for my ancestors (especially my Aunt) and all their powerfully feminine (and PINK) influences in my life. Faded photo from 1965…outfit all pink, including the shoes! Thanks for reading and I really love comments, especially when my vulnerable, pink insides are kinda hanging out there for all to see…. Posted on February 8, 2019 February 8, 2019 Categories "Maturing", Endings, Friend, Gratitude, Grieving, judgment, my kind of politics, Nature, personal history, Perspective, Spirituality, TreesTags changes, destruction, loss, Trees13 Comments on heart break…. Here’s my entry for VJ’s weekly challenge, River. Her’s is great and worth a visit! I ran away from home when I was just a kid…I mean, a LONG way from home. Left my beaches and my ocean in San Diego, and headed east in search of peace. Ended up in Natchez, Mississippi, and lived with relatives I thought could save me. I guess they did, but not how I had hoped they would. I lived in Natchez throughout high school, learned very hard lessons about education, religion, music, politics, and friends. Left there in search of my adult home, and for people less confusing. In the deep South, they were, and still can be, the most warm, open, loving, giving people you will ever meet…and some are also historically and genetically predisposed to be filled with hate and prejudices. Dual Realities. But that river. She really gets under your skin and draws you back and back and back again. And I’m glad she does because without her pull, I never would have ended up with the love of my life, James. Natchez was his San Diego. So we go to visit as often as we can. Ol Black Water, indeed. (sound track for your visit to THE River. Bright and early on the day before we were to leave Natchez, Mississippi for home, we took the Toyota van in for an oil change and return-road-trip check up. We expected this to be a quick, hour long process as we were booked solid with last minute wedding preparations for my cousin’s nuptials and reception that evening. After some time waiting they came and told us we needed a new radiator, that this one was shot and that it was leaking coolant everywhere. News to us as we had seen no leaks and had had no problems. They showed us the huge puddle of coolant under the car and the supposed damage to the radiator. There’s a saying that applies to men, about certain body parts being held in such a way as to trap said man. I don’t know what the comparable saying is for women…”they had me by the ovaries“??? But anyway, clearly the radiator was NOW hemorrhaging fluid so we had to agree to a new one…which they of course, had in stock, right? So they said anyway. After waiting a few more hours of crucial wedding errand time, they finally informed us that the new radiator had to come from Vicksburg, a mere hour and 25 minutes away. So they gave us a loaner car. Right up until their closing time, which coincided exactly with the wedding start time, they still had not received the new radiator. This was no small deal. We had to make the trip from Mississippi back home to Washington to arrive on a very specific date. This delay could mean the difference between safe driving each day of our 4 day trip, with a nice sleep over in a motel…or driving straight through, pretending we were in our 20’s when we could actually pull off that sort of thing! It all worked out but was definitely touch and go, and very stressful. She mixed up sugar water in her hand. When we finally had to go, I put the little guy in a box and set it outside in the sunshine. Sure enough, fortified by rest and homemade nectar, the tiny intruder flew up, up and away! I can still feel those tiny feet in my hand. Kinda balanced things out, you know? 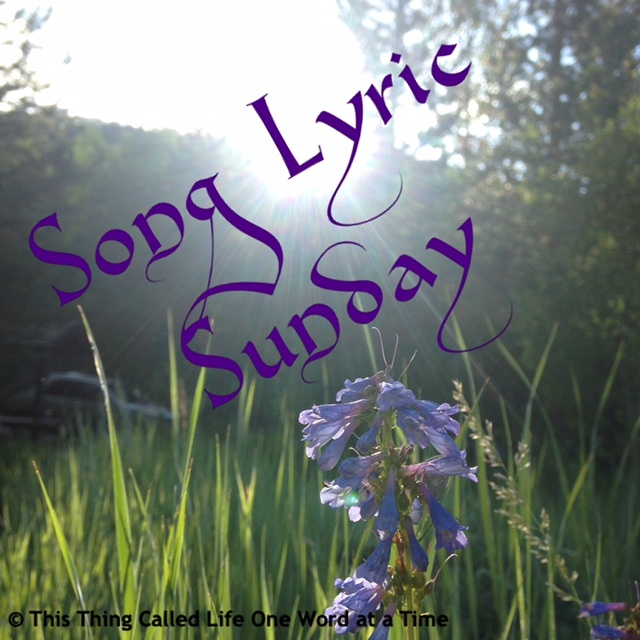 The theme this week is vengeance or revenge…hmm, harsh but there is a great song that comes to mind. It may be more about the power of anger. But for “revenge” you could visualize playing this song to someone who has wronged you!! How is this not the biggest waste ever of a perfectly fine “structure” ??? ?